December 7, 2009 — Burbank, CA — Reprise Records will release the original motion picture soundtrack to the Hughes Brothers-directed feature film Book Of Eli on January 12th, 2010 — three days before the film hits theaters nationwide on January 15th, 2010. 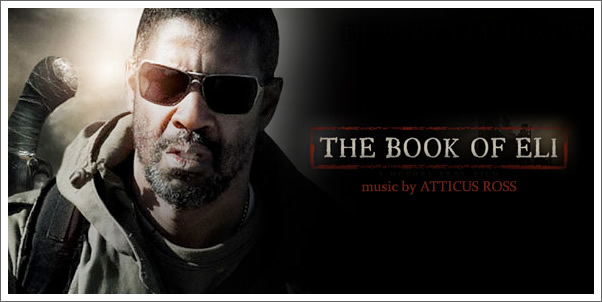 The Book of Eli Original Motion Picture Soundtrack features an original score by composer/musician/producer Atticus Ross, marking his third collaboration with the Hughes Brothers and his first feature film score. Ross’ music is a unique hybrid score of electronic and organic elements; writing with his wife (Claudia Sarne) and brother (Leopold Ross), the basic tracks were recorded at his studio in Los Angeles before departing to London where it was finished in Abbey Road Studios with a full 80 piece orchestra.Ross’ other film credits include co-writing and producing “Go All the Way (Into the Twilight),” the Perry Ferrell single for the hit film Twilight, the score for the Allen Hughes’ vignette for the film New York, I Love You, as well as the music to the Hughes Brothers TV show 'Touching Evil" . Ross has also incorporated his musical style into collaborations and productions of such major artists as NIN (the albums With Teeth, Year Zero, The Slip, and the Grammy-nominated Ghosts), Jane's Addiction, and Korn. The Book of Eli stars Denzel Washington, Mila Kunis, and Gary Oldman in a post-apocalyptic tale in which a lone man, Eli (Washington), fights his way across America in order to protect a sacred book that holds the secrets to saving humankind. The soundtrack will be released in four configurations: standard CD, a digital version available through all digital service providers, and a special exclusive iTunes edition that will feature a remixed track by Dave Sitek (TV on the Radio). A vinyl version will be released in February. Book of Eli is being distributed domestically by Warner Bros. Pictures.